My dad leaves tomorrow, which means all the projects we’ve had in the works for the past week are wrapping up. I use the words “wrapping-up” loosely because it implies the projects are complete. We’re almost there. I’ve got some nail holes to fill and some painting to do. Trim to install. I wish I could say they will be complete in the next week but the minute I put my dad on the plane, I’ll come home and try to put life back together. Piano lessons need to be given. Laundry needs to get done. My design work clients are stacking up. Everything has been on hold for the week. In the meantime my garage looks like this: Hunter and Bennett’s closet organization. 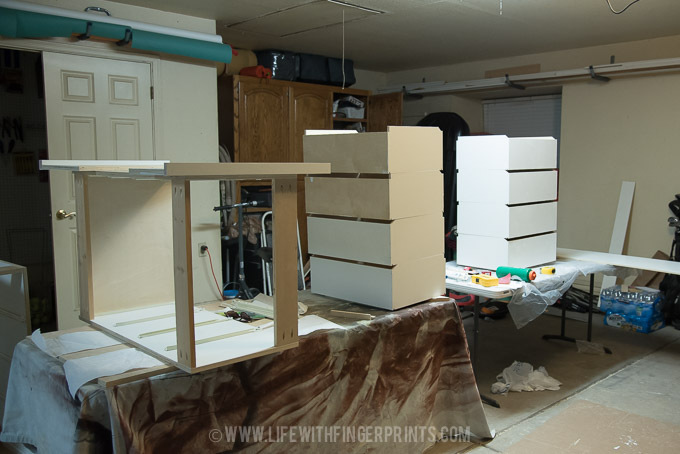 The boxes have been built and the drawers are stacked for ease of painting. Four days ago the garage look similar but it was the closet bookshelves sprawled across the floor. Have I mentioned my paint sprayer has been out of commission at the worst possible time. It’s been a while since I’ve hand painted this much wood – coat after coat, late into the night. I’m hoping tomorrow morning these boxes and drawers are no longer sitting in the garage and that they make their way upstairs to the boy’s room. Fingers crossed!